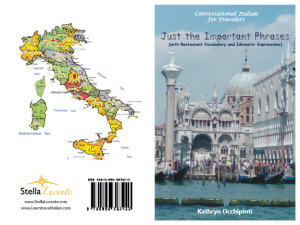 About Conversational Italian for Travelers Books | Conversational Italian! The Conversational Italian! blog is a complementary site to the Conversational Italian! open Facebook group. 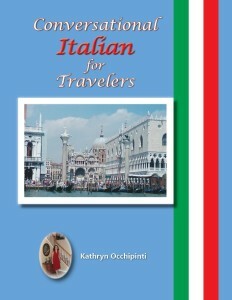 The Facebook group is based on the textbook and phrasebook from the Conversational Italian for Travelers series available on Amazon.com and Learn Travel Italian.com. If you like what you see, join the conversation on our Facebook page. Interested in private Italian lessons via Skype? Contact us at info@learntravelitalian.com or fill out and submit our Contact form. We learn language and culture as we follow the character Caterina in dialogues that detail her travels through Italy. As she boards planes and trains, and finally takes a ride in her cousin’s car, we learn how to do these things in Italian. When she meets up with her Italian family, we learn phrases for communicating with others, including what to say if you meet someone special, how to go shopping, and how to use the telephone. Finally, Caterina goes on a trip to Lago Maggiore with her Italian family, and we learn phrases needed to stay at a hotel, go sightseeing, and of course, go to a restaurant and order wonderful Italian food! Many Italian dishes commonly ordered in Italian restaurants are listed in the last three chapters of the book. The Conversational Italian for Travelers textbook really makes the Italian language and culture come alive! Your traveling companion in Italy! If you are traveling to Italy, you need this book! Excerpts from the “Just the Important Phrases” sections of the Conversational Italian for Travelers textbook have been compiled in a pocket-size reference book perfect for taking along on your trip! Keep handy simple phrases of greeting, how to change money, or how to take the train. Learn about how to communicate politely in any situation. And, of course, learn how to read Italian menus and order at an Italian restaurant! Included are excerpts from the “Idiomatic Expressions” section of the textbook and a list of many Italian dishes commonly ordered in Italian restaurants. Just the Important Phrases contains everything you need to know to converse like a native while in Italy! Here we list our other reference books, which include material reproduced from our textbook for quick and easy reference every day, even while in Italy! Sponsored by Stella Lucente, LLC, and Learn Travel Italian.com. Thank you! Glad you are looking forward to reading more about Italian! Hi, what a good idea this blog is! (As a one-time ESL instructor, I appreciate all efforts to share languages & increase mutual interest & understanding.) Thank you for following my blog. I keep hoping that because I speak Spanish I’ll somehow just understand Italian — but of course it doesn’t work that way! You are correct. Italian and Spanish are similar, as both are romance languages, but you will not really understand one by knowing the other as only some words are similar. The good news is that if you want you can more easily pick up Italian since you already have a basic understanding of how to “think” in a romance language!